Ever since I was a small child I have had the conviction that my life would end on some scaffold or other at the hands of a public executioner. I suspect that the reason for this is my short temper–there have been many occasions on which I have experienced a strong desire to commit murder, but I have hitherto successfully managed to keep axe and machete out of the skulls of the imbeciles who plague my life. If I were executed, I would at least like to have the satisfaction of committing the actual crime first. It must be awful to stand on the trapdoor with the hangman’s noose about one’s neck, and know that one is innocent of the crime for which one is being executed, not to mention the bitterness of knowing that the real criminal has enjoyed the thrill of committing his crime without being asked to pay the price. We know that this has happened in the past: the hapless Timothy Evans hanged for the murders committed by Christie at 10 Rillington Place, and the innocent Hauptmann broiled in the electric chair for the kidnapping and murder of the Lindbergh baby are two examples that spring to mind. We hope that these examples of judicial murder are isolated, one-in-a-million freaks of misadventure that are, with forensic technology advancing apace, not to be repeated. However, a piece of research has recently come to my attention that, if its data accurately reflect reality, means that these sorts of errors may have been and may still be far commoner than previously thought. 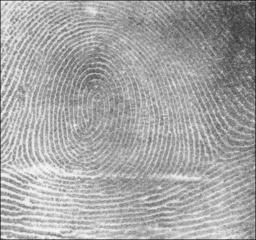 The paper, Contextual information renders experts vulnerable to making erroneous identifications by Itiel E. Dror, David Charlton and Ailsa E. Peron of the University of Southampton, casts chilling doubt on the value of evidence that has been regarded as the “gold standard” of forensic evidence—fingerprints. What they did was take five fingerprint experts from various agencies and give each of them a pair of fingerprints (latent and a rolled exemplar) that they had each several years before found to be a match. The experts were told that the latent print was one lifted from the suitcase used in the Madrid train bombings and the rolled print was that of Brandon Mayfield, who had been wrongfully arrested for the crime but had since been cleared. Four of the experts changed their minds and ruled that the prints were not a match (they actually were a match, and had been verified blind by two other experts). International Association for Identification (IAI). The results were disappointing. Four suspect cards with prints of all ten fingers were provided together with seven latents. Of 156 people taking the test, only 68 (44%) correctly classified all seven latents. These studies show that fingerprinting, far from being the objective, scientific discipline that we thought it was, is in fact subject to the prejudices of the analysts charged with comparing the latent and exemplar prints. Every single conviction that has hinged on fingerprint evidence is suspect in the light of this research, and the results of the studies demand an overhaul of the methodology of analysing fingerprints. I have never believed that the portrayal of fingerprint comparison as depicted in television programs like CSI are accurate. (A computer flashes prints on the screen, then beeps and flashes “Affirmative” annoyingly until someone shouts, “Eureka, we have a match!”) I did, however, think that there was some sort of scientific rigour in that the person doing the analysis would at least be insulated from the context of the case, in other words they would be given the prints and no other information, so their decision would be based solely on the prints and not on anyone else’s opinion as to whether or not a match is expected. Another problem with fingerprints is that there are methods of planting a fingerprint on a surface near which the finger in question has never been. An example was uncovered in the Inge Lotz murder trial, where the breathtakingly incompetent police tried to plant Fred Van der Vyfer’s fingerprint on a plastic DVD case in Inge Lotz’s Stellenbosch flat in an attempt to place him at the murder scene. Fortunately for Fred, the dimwitted flatfeet had lifted the print from a curved substrate and planted it on the flat DVD case, which was obvious to the FBI experts hired by the defence, and Fred was acquitted. So when I do inadvertently leave my thumbprint on the Kenwood Chef I use to convert you into dogfood (you know who you are), I’ll be able to so discredit the evidence that I’m quite sure I’ll get off scot free. You don’t feel so smugly secure now, do you? No one has officially exonerated Hauptmann, but the obviously fabricated “evidence” that secured his conviction leave very little doubt that he was innocent. Zabell, Sandy. “Fingerprint Evidence”. Journal of Law and Policy. http://wwy.brooklaw.edu/students/journals/bjlp/jlp13i_zabell.pdf. You are currently browsing the Grumpy Old Man blog archives for April, 2011.